Seems as though some of that factory expansion is reaping dividends, because the delivery times for a new Tesla Model 3 order have been dropped to as little as a month in the US, down from the 3-5 month delivery window that was previously in place. The change comes a couple of weeks after Tesla changed the available options on Model 3s and is a tentative sign of the car maker coming to grips with. Both the long-range rear-wheel model (until recently the only one in production) and the performance dual-motor model are now showing delivery times of 1-3 months. That leaves the long-range dual-motor model configuration, yours in approximately 2-4 months once you've put your cash down. This is just a few days after orders were opened up to everyone in the US, reservation or not. The company has been busy trying to meet production targets for the cheapest car it sells, though as yet the most affordable option – yours for $35,000 (or about £30,000) – still isn't available. For now Tesla needs bigger profit margins on its motors. Of course a wider choice of models means more complexity on the production line, so Tesla is taking the process step-by-step. 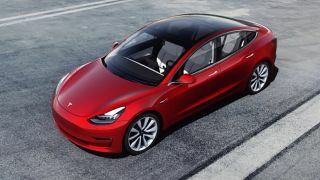 Back in April Elon Musk confirmed to a pre-order customer over Twitter than Tesla would need to be churning out somewhere in the region of 5,000 cars per week before some extra models would be made available. Meanwhile the car's self-driving capabilities continue to be improved. Thanks to the latest software update, the on-board Autopilot tool can park all by itself – maybe another reason to put your name down for a new electric Tesla.